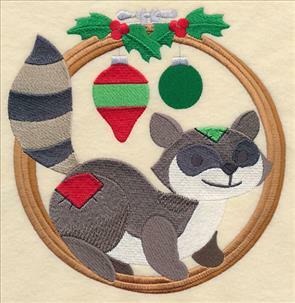 Hoop it up, and fill your home with Christmas spirit! 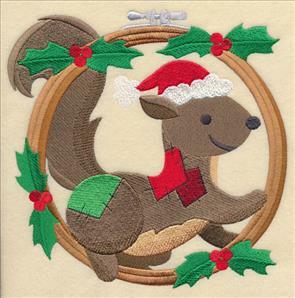 New machine embroidery designs feature a variety of cuddly and colorful critters. 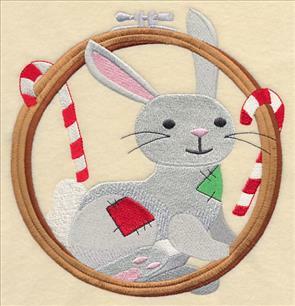 Each are framed in hand embroidery hoops and surrounded by holiday icons, elements, and greenery. 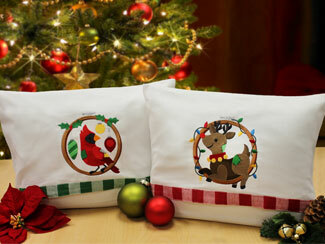 These new designs are filled with Christmas charm and spirit! 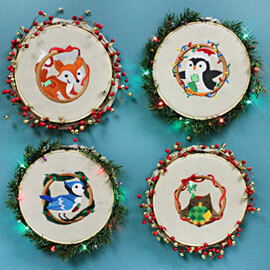 They're warm-hearted, cheerful additions to your holiday decor. 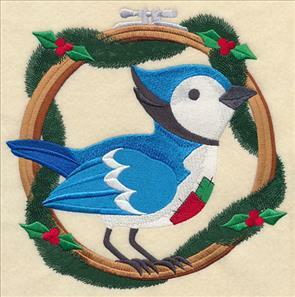 Stitch them onto tree skirts, shirt fronts, stockings, wall decor, and pillow covers. 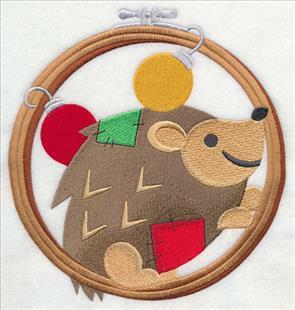 Embroider onto a tea towel, then transform into a pillow cover! 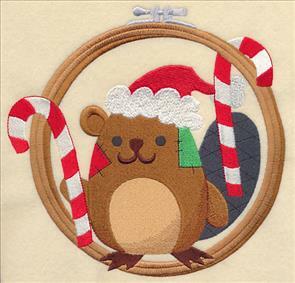 In August we drew and digitized 25 crafty critters in embroidery hoops, and those designs received rave reviews from embroiderers everywhere. 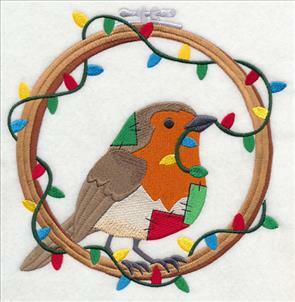 We received many, many requests for more, including designs with Christmas themes. Your wish is our command! 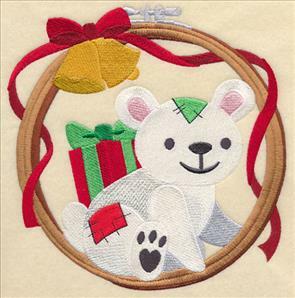 Below you'll find 25 new designs that are replete with holiday charm, and ready to bring a holly-jolly spirit to your gifts and projects! 7.25" x 7.54" and 6.47" x 6.72"
5.52" x 5.74" and 4.53" x 4.70"
7.68" x 7.82" and 6.85" x 6.97"
5.85" x 5.96" and 4.80" x 4.88"
owl waits for a kiss under a sprig of mistletoe. 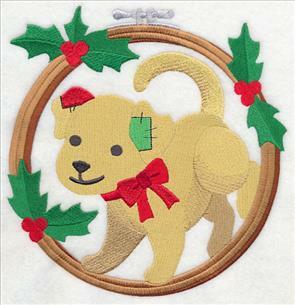 Delightful on placemats and bath towels! 7.30" x 7.71" and 6.51" x 6.87"
5.56" x 5.87" and 4.56" x 4.81"
7.22" x 7.78" and 6.43" x 6.93"
5.50" x 5.92" and 4.51" x 4.85"
Christmas birds bring cheer to stockings, table runners, and tree skirts. 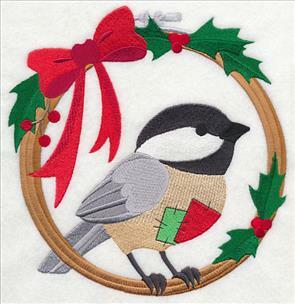 A chickadee poses under holly and a bright red bow. 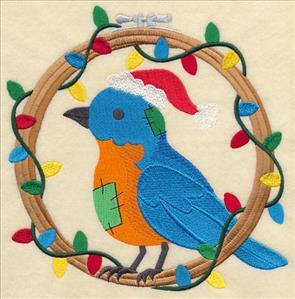 And, a bluebird sports a Santa cap, surrounded by bright holiday lights. 7.40" x 7.67" and 6.61" x 6.84"
5.65" x 5.85" and 4.63" x 4.80"
7.65" x 7.74" and 6.82" x 6.90"
5.83" x 5.89" and 4.77" x 4.83"
A bluejay and deer make spirits bright! Bright green holly and silver jingle bells are classic Christmas images. Add these designs to mantel runners, banners, and wall hangings. 7.73" x 7.72" and 6.90" x 6.90"
5.89" x 5.89" and 4.85" x 4.84"
7.42" x 7.69" and 6.61" x 6.85"
5.65" x 5.86" and 4.63" x 4.80"
Bring Christmas cheer to stockings for the pets! 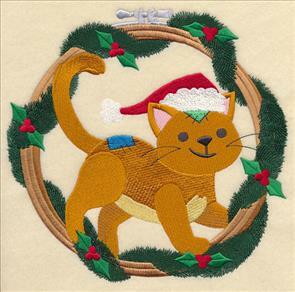 A Christmas kitty is shown left, wearing a Santa cap and surrounded by holly and garland. On the right, a Christmas pup wears a bright red bow, and is accompanied by festive holly. 7.80" x 7.53" and 7.08" x 6.79"
6.07" x 5.81" and 4.97" x 4.77"
7.37" x 7.55" and 6.57" x 6.73"
5.61" x 5.75" and 4.61" x 4.71"
Polar bears and penguins are classic symbols of winter, and Christmas. See the friendly and familiar faces below! Each has cozy patchwork squares, bringing a crafty and cozy look to the designs. 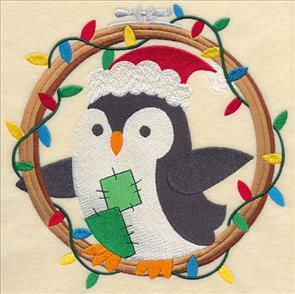 The polar bear is accompanied by red ribbon and bells; the penguin is surrounded by colorful Christmas lights. 7.37" x 7.50" and 6.57" x 6.69"
5.61" x 5.71" and 4.60" x 4.68"
7.80" x 7.75" and 6.95" x 6.91"
5.92" x 5.88" and 4.87" x 4.84"
A European robin, left, decorates his hoop with a string of Christmas lights. 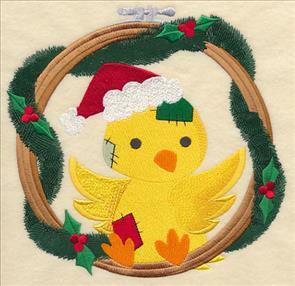 A sweet little chick, right, is surrounded by colorful garland and holly. 7.56" x 7.69" and 6.74" x 6.86"
5.76" x 5.86" and 4.72" x 4.80"
7.74" x 7.45" and 6.91" x 6.65"
5.92" x 5.68" and 4.86" x 4.66"
Let your imagination fly high with these Christmas birds! 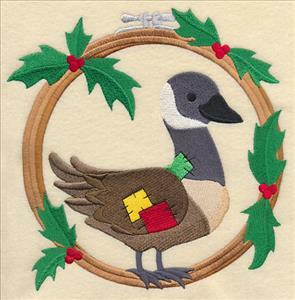 A Canada goose and duck have colorful patchwork squares. 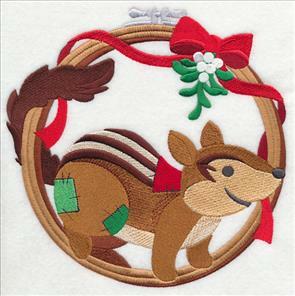 Their hoops are decorated with classic holiday imagery, such as mistletoe, ribbon, and holly. 7.50" x 7.56" and 6.69" x 6.76"
5.72" x 5.78" and 4.68" x 4.73"
7.48" x 7.50" and 6.67" x 6.69"
5.69" x 5.71" and 4.67" x 4.69"
Circular designs are a wonderful shape to fill the space on towels, aprons, placemats, table runners, and tree skirts. 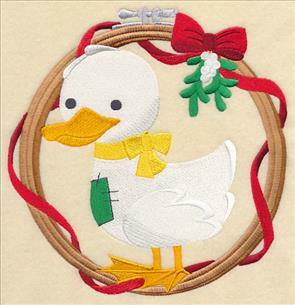 Add Christmas color and charm to your decor and gifts! 7.79" x 7.61" and 6.95" x 6.79"
5.93" x 5.81" and 4.87" x 4.80"
7.10" x 7.45" and 6.34" x 6.65"
5.42" x 5.68" and 4.45" x 4.66"
A busy squirrel - and a busy beaver! 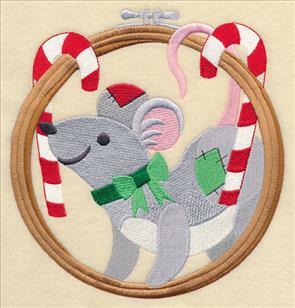 - are ready to deck the halls for the holidays! 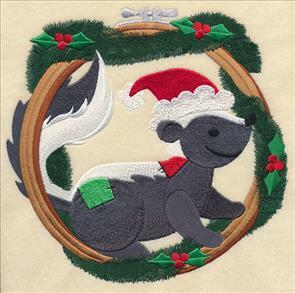 Stitch these classic Christmas colors onto pillow covers, bath towels, kitchen towels, and more. 7.58" x 7.51" and 6.76" x 6.69"
5.78" x 5.72" and 4.73" x 4.69"
7.70" x 7.45" and 6.86" x 6.64"
5.87" x 5.67" and 4.80" x 4.65"
A raccoon poses underneath colorful Christmas ornaments, while a chipmunk meets you under the mistletoe. 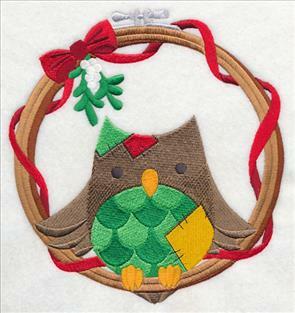 These designs are filled with holiday spirit, and will bring charm to gifts and decorations. 7.23" x 7.47" and 6.45" x 6.66"
5.51" x 5.69" and 4.52" x 4.67"
7.57" x 7.52" and 6.75" x 6.71"
5.76" x 5.73" and 4.69" x 4.66"
A Christmas rabbit poses with peppermint sticks, while a hedgehog balances Christmas bulbs. 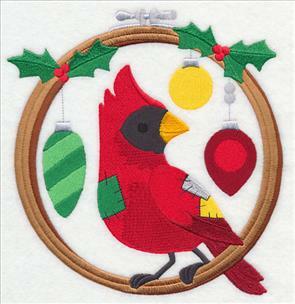 They'll be colorful and fun on Christmas stockings, placemats, linen towels, and wall hangings. 7.16" x 7.50" and 6.38" x 6.69"
5.45" x 5.71" and 4.46" x 4.67"
7.14" x 7.49" and 6.37" x 6.68"
5.44" x 5.70" and 4.46" x 4.67"
Last, but not least, is this sweet little hamster. 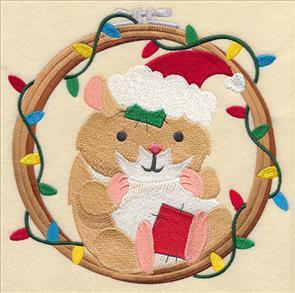 His chubby tummy is a delight on stockings, towels, and tree skirts! 7.69" x 7.64" and 6.86" x 6.81" and 5.86" x 5.82" and 4.80" x 4.76" and 3.86" x 3.83"
Order the designs singly by using the links above, or get all 25 in a design pack! 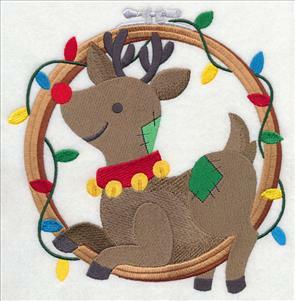 These festive designs can be used in so many different ways - aprons, pillow covers, stockings, tree skirts, towels....and wall decor! 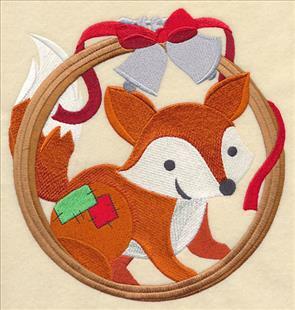 Embroider the designs, then "frame" them in hand embroidery hoops. Hang them to deck your walls and halls for the holidays. Battery-operated lights are fun to surround the hoops, also. Questions? Let us know! 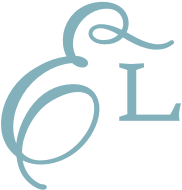 Send an email to us: support@emblibrary.com. 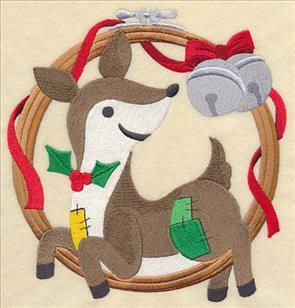 Create a crafty display by framing these festive designs in embroidery hoops!